Born in Caracas, Venezuela, Mr. Cubek began private piano and composition lessons at the age of 7 before entering the Simón Bolívar Conservatory. In 1999, he moved to Montreal to continue his music education, studying piano and music theory at McGill University and orchestral conducting at the Conservatory of Montreal. At the latter institution, he was awarded First Prize with Great Distinction in orchestral conducting. 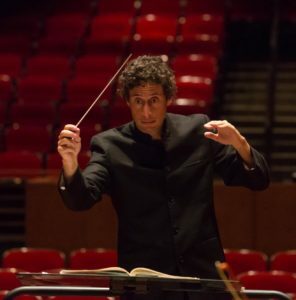 Mr. Cubek completed his doctoral studies in orchestral conducting at Northwestern University, where he served as assistant and guest conductor of the opera program, and the Chamber and Symphony Orchestras. He was music director of the University of Chicago Chamber Orchestra and a lecturer in music theory at both Northwestern and McGill. In addition, Mr. Cubek has led ensembles in Brazil, Canada, Costa Rica, the Czech Republic, Ecuador, Italy, Mexico, Italy, and Ukraine. A recipient of Scripps College’s Mary W. Johnson Award for excellence in teaching, Mr. Cubek is an enthusiastic advocate of new music. At the Claremont Colleges, he regularly teaches classes based on 20th- and 21st-century repertoires. As conductor of Fonema Consort, he sustains an active international concert schedule focused on premiering new compositions. Click here to visit his personal website.